Sloggi Basic Maxi For Men, comfort fit single pack Basic Maxi. A Sloggi For Men original with a Y-Front fly! Discreet Sloggi branding on waistband. Made from high quality cotton spun around superfine Lycra® fibre. This range is hard wearing, easy to care for and well positioned seams – all the attributes of exceptional everyday underwear. 87 year old father delighted with his new pants. 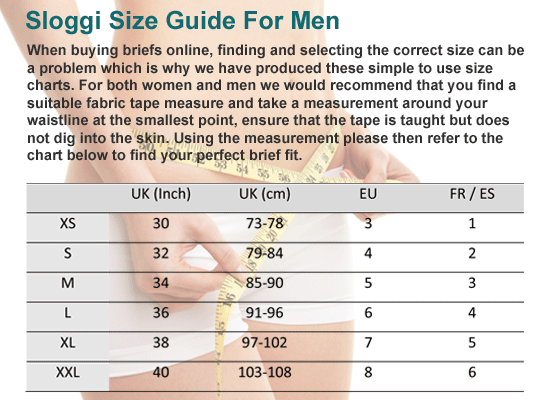 Have looked for a while now to replace the Sloggis that my husband finds so good but they seem unavailable in shops and not readily available on line so very pleased to have found this supplier with such a great selection of underwear. Have found over the years that i have worn sloggi that it has began more difficult to find shops that actualy sell them or to find on line. I decided to try Needundies and was very pleased that i did. Favourite product over a number of years. Order expedited with your usual efficiency. Do find them a little pricey.